Michele, my wife, and I are voracious readers. She tends toward Scandinavian crime novels and I tend toward hard sci-fi, with us both dipping our toes into fantasy novels from time to time. Over our 20+ years together, we collected quite a library of books, filling upwards of three Billy bookshelves. When the girls where little, our date night usually consisted of dinner and then a trip to the book store where we’d wander and each pick up 2–3 books to chew through. Once the Kindle arrived, things began to change. Reading a paper book, I found myself frustrated that I couldn’t press on the word to see a definition or highlight a passage. Fairly quickly, we moved to only reading on Kindles and not buying paper books. After some time, we began to look at our wall of books with different eyes. Michele wanted more space for art and knick-nacks, and I was happy to get stuff out of the house. So we basically gathered up all the books we had and donated them to the library. 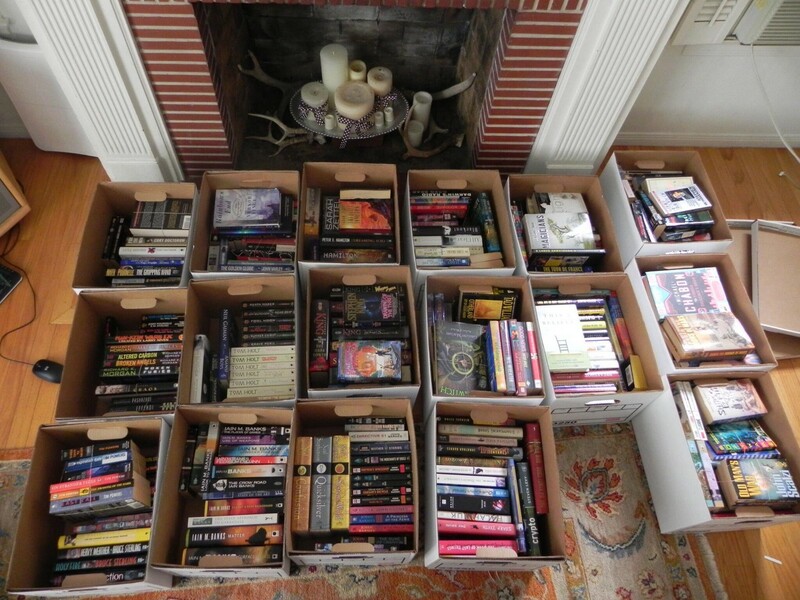 Part of our library, (sorted by author of course), ready to be donated. It was simple, easy, and we felt good about making an improvement to our local library. The hope that others would have a chance to enjoy these books exists when they are in the library, but not when they are on our shelves, gathering dust. It’s been 5 years now since we gave them all away and we regret nothing. Recently there’s been a lot of hyperventilation about Marie Kondo “keeping only 30 books” recommendation. The truth is, she’s right. You don’t need all those books. We still pick up books from time to time, either with art/photos or books with far more design than simply text. But the vast majority of what we read are novels with only text. Coming to realize that having the books was more about keeping score than ever going back to reread them was half the battle. Books are often deeply associated with the time in your life you read them, and I can understand the emotional connection. Happily, your memories don’t leave your home when the books do. In the end, it’s just a book. With so much amazing new books being written, it’s unlikely we’ll ever go re-read a novel, and if we wanted to, we’d read it electronically, not on paper. Even better, most libraries are now offering to check out books electronically via Overdrive and other systems for free.